You don’t pick chiropractic, chiropractic picks you. Chiropractic medicine needed Dr. Christian Carroll, and the divine hand guided Christian down the right path. 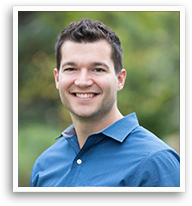 Christian’s journey towards health and the practice of chiropractic medicine started at a young age – and was strongly influenced by his mother. In 4th grade I had daily stomach pains. My mom took me to the pediatrician repeatedly, but they kept reporting I was fine. My mom didn’t like this. She took it into her own hands and asked me what I ate for school lunch. I replied, “Cheeseburger almost every day.” She suggested I try just a plain hamburger next time. My mom, ahead of her time, had figured out I was lactose intolerant.Thank God for moms who don’t listen to the doctor when their kids don’t feel well! Christian learned that he was lactose intolerant – but he understood the deeper lesson: food can hurt or heal the body. As a young athlete, Christian dislocated and fractured his shoulder – and was introduced to the power of physical therapy and rehabilitation exercises. Christian also suffered the consequences of his playing style on the high school hockey team. One check too many led to a severe lower back injury that rehabilitation exercises could not touch. Christian’s mother again stepped in – this time to suggest that Christian visit her chiropractor. I learned about the spine and misalignments and how those can interfere with our body’s innate ability to heal. After being adjusted for just a few visits, I was back on the ice – skating without pain! Thanks mom for my first foray into how chiropractic and spinal alignment can help heal the body! then come see us at Heritage Integrative Healthcare. Dr. Christian Carroll and the team will take a unique and holistic approach to put you on the path to health and wellness. Dr. Carroll is a Maine and Massachusetts Board Certified Chiropractor specializing in Applied Kinesiology. He brings an integrative background in muscle testing, functional medicine, nutritional supplementation and stress relief techniques to his chiropractic practice. Dr. Carroll earned his Doctor of Chiropractic degree at the National University of Health Sciences in August 2014. He completed his undergraduate studies at James Madison College in May 2010 and received his certification in Applied Kinesiology from the International College of Applied Kinesiology in August 2010. Dr. Carroll is an active member of the Maine Chiropractic Association. Dr. Carroll was in private practice in Hopkinton and Groton, MA before joining Heritage Integrative Healthcare in April 2017. In his free time, Dr. Carroll enjoys boating around Casco Bay and Cape Cod. He is an avid New England Patriots fan, likes to read and travel, and enjoys spending time with his family.